Stepping between Taylor James and an even bigger statement was Camille Peisner. It's not like we didn't know about Taylor James already. She had a fabulous freshman cross country season this past fall. Then, going back years out of memory before that, she's torn up the club track scene. While most people are still trying to figure things out in January, James is busy adding polish. What was her day like? Try on three firsts and a third. James tied for first in the high jump at 5-4 (the meet didn't do a tie-breaker on the high jump title), won the 600 by nearly three seconds at 1:39.02, finished second in the 400 at 59.84, and the took the 200 at 26.43. That's one set of legs that figures to be sleeping pretty hard tonight. Camille Peisner broke up the James sweep of everything with a stunning 57.21 in the 400. Isn't it a little early for anyone to be that fast? Wow. Maya Provencal led a parade of four girls who ran sub-8 in the 60. Dawnielle Lewis, Casia Provencal, and Mia Manson claimed the other three spots. You may have had Manson picked to win the pole vault, but she was saving her pole for tomorrow at the Air Force Academy. She did, however, long jump, placing 17-7 for second. Valor's Sadie McMullen took the win in the sand with a jump of 18-5. Meanwhile, Manson's absence in the pole vault provided clear sailing for Lauren Jarossy to claim the win with an 11-5.75. Layla Roebke came back to Colorado Springs for a quick visit to win the 1000 in 3:08. Most people stay longer in the Springs than that when they come. 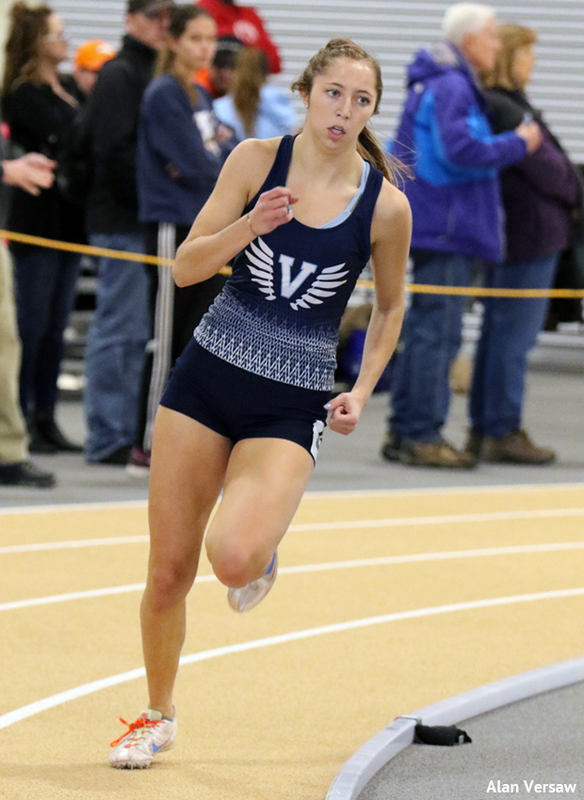 Lanie Szuch doubled her fun, winning the mile in 5:23 and the 3000 in 10:31. Szuch took a few boys down with the latter. Maya Provencal and Lizzie Waters traded hurdle victories, with Waters posting the best time in prelims and Provencal in finals. Waters got second in the pole vault as well. Raquel Reese was the heretofore unnamed individual who split the high jump title with Taylor James. Lily Margolis went beyond 35 feet to win the triple jump. And Emily Arseneau fired an early warning cannon ball over the shot put field with a 38-6.5.